It has been a busy weekend and an even busier week is beginning. We are in our final days of getting ready for May Day on Friday!! I have found a beautiful Muu'muu for the event and am practicing my hula everyday. Yes, even the teachers go out and perform! The kids love this!! They are so proud when I go out there to dance, and I am proud of them for always trying so hard and doing their best. It is always a bit strange to me when a few teachers choose not to dance every year. They say they are not coordinated or they just can't do it and I respect their choices. But we ask every child in our school to go out there and perform whether they can dance or not and they do it. I feel as teachers we need to model the proper behaviors and attitudes that we want our students to emulate. By going out and dancing my students look up to me and respect me for taking a chance and contributing as part of our school community. I respect them for taking a chance and performing in front of hundreds of people. Yes, I get nervous and I may forget my steps or turn the wrong way, but in the end I am proud of my accomplishments and so are my students. So where is all this leading....The key word RESPECT. Maria over at Be The Difference hosts a linky party called Make A Difference Mondays. She has lots of great ideas and wonderful resources on how to teach respect to your students and children. I really believe that the best way to teach anyone Respect is to model it constantly. Not just talk about it or do one lesson, but to show it each and everyday. Start with ideas that students can relate to such as Respect All Living Things. This includes people, plants, animals and even insects. When I see a cockroach run out of my closet, or run across the floor I don't kill it...and I teach my own children and students the same. I get a broom and sweep it out the door. We don't squish that huge spider that runs across the white board, we just move away from it and hope he leaves the same way he came... We came home today from school and my daughter said "Mom, there is a weird cockroach on the floor." Okay, so I know you want to smash it right!! A scorpion in my house!!! But I grabbed a cup and placed it on top of this little guy and we put him in a big glass bowl. My daughters named him and went outside to hunt for things it could eat. They then asked if we could get on the internet to find out more about scorpions. I always show my kids it's okay to be scared, but we don't have to kill it. Every living thing has a purpose on the planet and we have to respect them, even if they are creepy and scary. Oh, I did freak out and squeal a bit! I kept looking around thinking are there more!! But after the initial shock I realized he was pretty tiny and was glad no one stepped on it! OK, these HURT! My friend Mary lives in the country near San Antonio and she gets these in her house. Ick! That's funny that you compare them to cockroaches because it puts it all in perspective. Barbara our cockroaches out here are huge!! And they fly!! This guy didn't jump or fly at me so it was pretty easy to deal with, lol! What a wonderful lesson! I love it and think it's a perfect addition to the Make A Difference Mondays linky party. Thanks again for linking up!!! PS I have never seen a real live scorpion! I am in michigan!!! 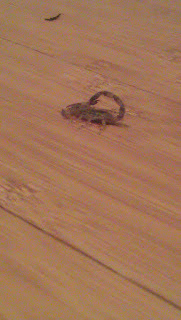 I wouldn't have squished the scorpion, but I probably would have screamed and let him have the house to himself! That would have freaked me out! What a totally awesome learning experience for your girls, though. I LOVE this post, Corinna. I totally agree with what you said about teacher performances. I'm one of the teachers who always passes 'cause I hate being in the limelight, but what you said makes so much sense, that I'm going to join in the next time the opportunity arises. And I'm like you. I try to never kill the bugs in my house. I just move them outside. I think learning to respect all life, even creatures you think are yucky, is hugely important. When my boys were little I referred to all bugs as "Mrs." or "Mr." just to try and show the boys that these little creatures deserve their life, too. Sorry for rambling, but you really hit on some important issues for me. Love your philosophy of respecting all living things. I try to teach my kids the same thing. Come check out my All Time favorite read alouds. You may even be able to win a bag full of my favorite books.